Bottom line: Push up the store switch and hold. A red LED will flash a few times. While keeping the store switch up, press the Loop button and hold. Red LED comes on then off. Keep holding the Store and Loop Switches. After about 13 seconds an Orange LED comes on. It changes to Red and goes off. Wait. The Red LED will flash three times. Release Store and Loop. The distortion problem should disappear! Edit: 2/21/2018: It's a hassle continually resetting. I called customer support and they recommended a better power supply. I thought that was bogus, but I did it anyway; I upgraded to a proper, independent power brick and, well, it solved the problem. 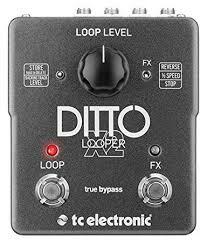 If I'm using the looper a lot without a power down, I'll reset, as above, but for the most part, the problem went away.